Recently i gave a Xamarin/MvvmCross training for one of our clients. During this training there was an assignment on which we would use MvxRecyclerView to display a list of items that we took from a webserver. There where however some issues, in this blogpost i would like to clear up on how to bind a list of items for Android an iOS. The MonkeysViewModel will be a really simple ViewModel. Real life scenarios would probably be different but the principles are the same. We will add a new model called Monkey and a MvxObservableCollection on which the views will be able to bind. Right click your ViewModels folder in the Core solution and create a new class called “MonkeysViewModel”. Let it extend MvxViewModel. Also create a MvxObservableCollection property named “Monkeys” which has a generic value of “Monkey”. Now you will be able to add some monkeys! Also make sure that your AppStart points to the “MonkeyViewModel”. In the Android project we will add a new view called “MonkeyView” and bind it to the ViewModel. In the layout we will add a MvxRecyclerView and bind that to the MvxObservableCollection. 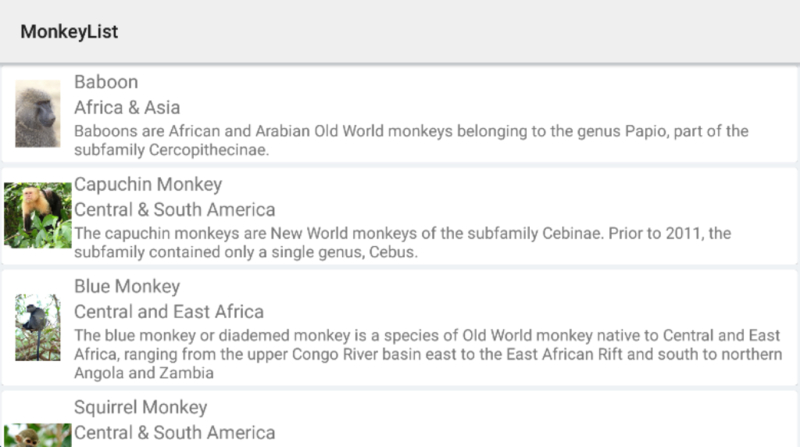 The MvxRecyclerview will take a template that will display our monkey data! Before we start we need to add some nuget packages to make this work. We want to use the MvxRecyclerview and thus we have to add it to the project. *Note that you should accept the sub-packages as wel. Some important things to point out are the MvxItemTemplate and the MvxBind. The MvxItemTemplate will bind every item in the ObservableCollection to the layout that is selected in here. Note that we still need to add this layout(that’s the next step). The MvxBind will bind our ObservableCollection called “Monkeys” as its itemsource. By doing this we don’t have to write our own adapter because MvvmCross already took care of it! In some cases you might want to be different templates. That is entirely possible with MvvmCross and its TemplateSelector. More information on how to use this can be found on this great blog post. To use this we simple replace the MvvmCross.Droid.Support.V7.RecyclerView.MvxRecyclerView with MvxRecyclerView.